So I’ve been giving PhatDeals a lot of thought lately and have tried to come up with an explanation for why we failed and what to do better next time. In this post I’ll discuss reasons why I think we didn’t succeed and ways to do it right in the future should we decide to go back to the drawing board and give PhatDeals another shot. 1. We got an office. While it was nice to have an office, we didn’t have an income to support it and it drained what little resources we did have. I had a perfectly good living room in Goleta that we could have used as our home base. 2. We got interns too late. It took us forever to get our interns in place. It’s important to deploy as many people as possible to get deals when setting this company up so our hesitation to get interns until May/June 2010 was a killer. 3. We forgot what we were aiming at in the first place. Our original pitch was that we were the Craigslist of deals/coupons. Instead of taking Craigslist’s business model of only charging a few people for select services, we tried to get a monthly subscription from every business we approached, before even proving that we could provide them business. When we did get people to sign up, it was on a trial basis so we’d only get deals up for a month or two at a time, not enough to get traction and feet stomping through their doors. 4. No funding. This ties into number 1. We never got outside funding for our project. With no money we couldn’t think outside of the box on how to expand our services. We should have been thinking national but were only focused on Santa Barbara, and Isla Vista most of that time. 5. We didn’t have a .com. I think because we had two things changed about a normal .com name (the Ph instead of f in PhatDeals and the .net instead of .com) it held us back with people remembering how to get to the site. 1. Hire a new programmer to go along side with Jon. Jon’s great but he needs a companion that’s fresh and on the ball constantly challenging him to be better and improve the site. 2. Don’t charge anyone for our services. The business model is to grow large to the point where lots of people are coming to the site for their local business coupon needs, then charge for premium listings. We’d do this by having deals of the month in each category in each city at first, charging something like $10-$20 for a deal of the month; then, when we got too busy change it to deal of the week, charging something like $10 per week to have the deal in the top spot; then, when that got too busy finally move to having a deal of the day, charging $5-$10 per day to have the deal in the top position. 3. Get funding. Before getting started with the business of getting businesses to sign up, we’d need to get funding. Funding would pay for computers for our interns to take around to businesses to sign them up for the deals, and pay for the interns themselves. In California there are strict limitations on the difference between an employee and an intern, and having them go around to different businesses conducting “sales” falls pretty squarely in the role of employee. So we’d need to pay the interns at least minimum wage if not higher. I’d approach John Greathouse, my Entrepreneurship teacher from the UCSB Technology Management Program to ask his advice on whether we have a chance at funding or not without sales figures to show. Maybe we’d get an audience with the Tech Coast Angels. The question is- would you invest in the next Craigslist? 4. I propose that with funding (Something on the order of $1M to cover us for a window of about 2-3 years) we start in one large target market. I think San Francisco would make an excellent target, as it is a shining example to the rest of the world of what the next technologies are. There’s lots and lots of small businesses in S.F. and many of them are tech savvy. 5. Before we got funding, we might have to code up the remainder of the site. There’s a lot left to do, though we’re most of the way already there. We need to have multiple cities enabled, with their locations already defined in google maps and give the businesses the opportunity to input their addresses into this system. We need to build the opt in to premium listings in order to show the investors what it will look like (maybe we don’t need to do this yet. I’m not sure if saying we’ll do it later is enough.) We might need to get a credit processing section of the site as well. (Again, not sure if this is necessary as it’s not in the plan to start charging until much later.) Make it so that businesses have to manually remove a deal in order for it to come off the site. This way we don’t have to worry about expiration dates. Maybe. Also, give businesses the ability to send their deal to the top of the list by deactivating and reactivating the deal a maximum of once per day. This way they can control their listing if they so choose and also they can’t abuse it by constantly sending it to the top. Yeah. I guess there’s less to do that I thought. That’s kinda exciting. 6. Slowly and quietly build a repertoire of local businesses with postings with either no expiration dates on them or expiration dates of 6 months – 1 year or so on them. Possibly require that the deals be for a minimum of 25% off. 7. Either secure the PhatDeals.com domain or get a new domain with a .com. So that’s it. That’s what I would do better this next go around. It’s relying upon getting funding. I wouldn’t do it without funding, as I simply cannot afford to. Besides, this is the next Craigslist. It’s a long and hardfought battle to finally making a profit and requires years of hard work to get there. The only way it’s going to fly is with a strong funding base to get us there. Over the course of my illustrious internet surfing career, I’ve come across several blog articles and musings on the quote regarding how Henry Ford dealt with customers’ options for the color of their Model T.
One of my favorite recurring skits from Saturday Night Live is called “The Olympia Restaurant.” (You can find a fine example on hulu here.) 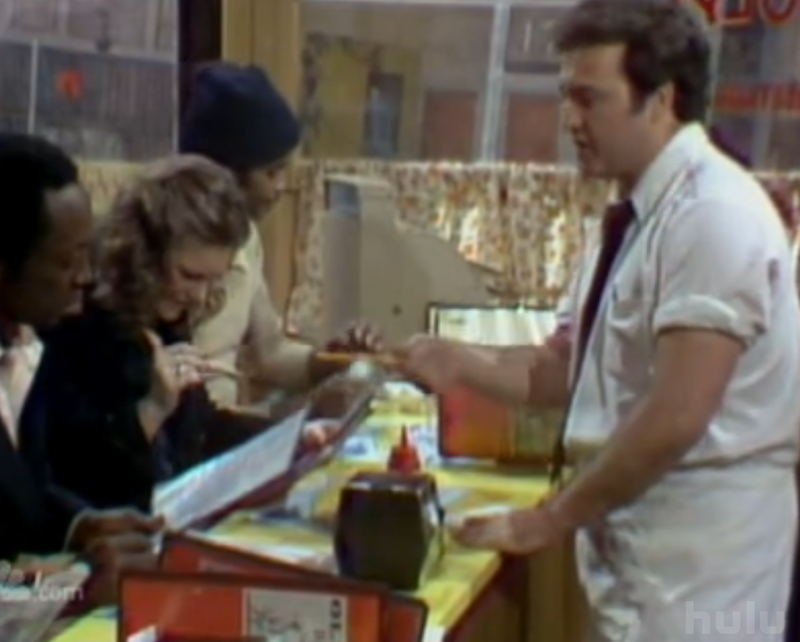 In the skit, customers come into a classic Chicago restaurant. John Belushi is behind the counter. The customers approach to order. Jane Curtin: I’ll have a tuna salad sandwich, and an order of French fries, please. John Belushi: No. No tuna. JC: You’re out of tuna? JB: No tuna. Cheezborger? Come on, come on, come on! I don’t have all day, we gotta have turnover, turnover. [ turns to Male Customer ] What are you gonna have? JB: Uh.. [ turns to kitchen ] Grilled cheese? 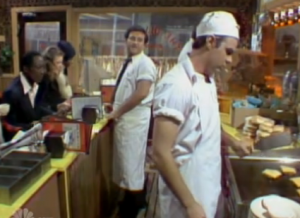 Dan Aykroyd: No grilled cheese. MC: Uh.. cheezborger and a Coke. JB: Uh, no Coke – Pepsi. MC: Okay, uh.. Pepsi, and french fries. JB: No fries – chips. 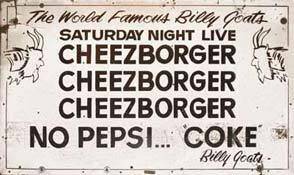 JB: [ to kitchen ] One cheezborger, one Pepsi, one chip! So.. why have I really harped on the almighty “Cheezborger”, and what role does it play at PhatDeals? If you enter your zip code or city as being within Isla Vista or Goleta, you get to see the deals we have in Isla Vista and Goleta. Of course it does. But.. now try New York or Boston or Austin.. and lo and behold, you can find deals in Isla Vista and Goleta. The thought behind this is that we’ll have deals in those areas but not quite yet. If you are starting a new product line, or a full-blown business, I highly recommend giving your customers a Cheezborger, Chips and a Pepsi. is not to create shiny masturbatory objects. the imagination of all those it touches. is dead and gone, or evil. and go have some fun! Hi folks. Last time, we left off by touching on sharing a vision with the team, and getting buy-in. In this post I’d like to explore further what getting buy-in means, and the different types of people I’ve encountered in my brief stint as the Co-Founder of our company. Though the following notion may be cliché to many of you, I feel it’s worth repeating: If you are in a startup for the money, you’re going to be sorely disappointed. Google did not have an effective business model for about 4 years. (Incidentally, check out their official timeline.) Larry and Sergey did not start it because they thought they’d be rich. Rather, they just wanted to hack a cool search engine together. They initially called it, “backrub”. Only later did it occur to them that they had a business on their hands. Oh, I must diverge on one more tangent: This video of Sergey Brinn on “To Tell the Truth” always amused me. So, in summary, please remember that while money is nice, expect your startup to have none for a very long time. This will be in exchange for months, to years of your precious time and energy. If that sounds fun, I cannot recommend anything more thrilling than to go for it; dive in head-first! The Race Horse is determined, and hardworking. They’ll run as fast as you can handle them. This is the person you put in charge of doing deep-background on your competition before a trade show. Or, point your race horse in the direction of potential sales leads, and watch in amazement as the orders come rolling through. Most lead salespeople are racehorses. What’s important when managing a racehorse is to understand their individual needs. Point one in the right direction, and give intermediate cues to enable them to monitor their progress. But don’t give direction, and they’ll be chomping at the bit and potentially bucking you off. I would say Ruben is our race horse. He produces amazing work at lightning speed; all he needs is some direction, and he’s good to go. 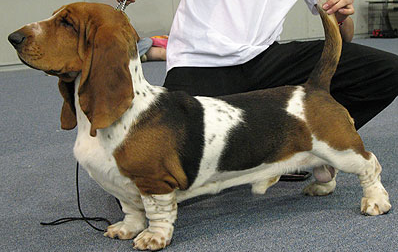 The Bassett Hound serves as the almost polar-opposite to the Race Horse. Bassetts are not fast. They don’t follow orders. They’re independently-minded. But, once they find a scent they go to the ends of the earth to track down their prey. The Bassetts in your company do so as well. They’ll produce work at half or one-quarter the pace of their peers, but the quality of their work is second to none. And they really need little direction- just the scent of what you’re looking for- and they’ll get it done exactly as it should be, and more. The biggest Bassett at PhatDeals is probably me. It’s taken 1 1/2 years to get PhatDeals to where it is today, but I’ve helped foster the ideas generated by the team, and execute them at just the right times. When I produce work, it is at times in smaller quantities than my partners, but the quality of my work makes up for this in spades. The Greyhound is a high-performer, and can work on their own. Their sense of smell is not as good as a Bassett’s, but their work output is superb. Once you show a greyhound where the rabbit is (share the vision of what their job is, and where it fits within the company at that time) they will go in the right direction without supervision until the rabbit must change direction, or becomes an entirely different animal. Sean is pretty close to being a Greyhound. His work output is superb once on track. When he has his eye on the ball, per se, he can focus in a way that many of us cannot- I’ve seen Sean work on a spreadsheet for hours at a time, fine-tuning the details to an extent that I tire from even watching him work on it. Sean is also very organized, a trait that is common with Grehounds. It takes a well-put-together datebook and iCal to do his job well. Okay, so admittedly I’ve made this one up. And of course the Grey-Bassett is next. The Race-Bassett has tendencies towards both high outputs stemming from clear guidance, and high-quality work at a slower, yet deterimined pace. They can see the big picture (Bassett) but can also produce work at a blistering pace when pushed. It’s important when dealing with them to communicate the vision, and acknowledge the good work they’ve done. Dan is our resident Race-Bassett. His understanding of the world around enables him to think like a Basset, and his work ethic kicks in when things really need to get done. The Grey-Bassett has the capability of getting on the scent, and once there can be most prolific with their work. The trick is getting them over that hump to smell the scent of the rabbit, or see the rabbit. Sometimes, they need to both see and smell the rabbit. Jon is our Grey-Bassett. It takes some effort to communicate with Jon, but when our visions line up he always comes through. It’s been fun starting this company with Jon, and I’m always challenged by his questions and devil’s advocacy. Here’s a test for whether someone is suited for working with your startup: Ask them how they would like to be compensated. If one of the first answers is “such and such per hour”, they are not for you. I actually had someone ask the question of how much they’d get paid, before even asking about how the company worked or what their role would be. If, though, within their first several words they mention “Stock options” or “equity” or “partnership”, or even something along the lines of “the experience is what really matters”, then give them a shot. With regard to forming a startup, if you must start with only two, the best two-person team I can think of is a combination of Bassett and Race Horse. Matt Stone and Trey Parker. Desi Arnez and Lucille Ball. Penn and Teller. Steve Jobs and the Woz. We’re fortunate enough to have a little of everything on our team, and I feel this has kept us afloat in the fickle waters of the sea of college startups. Hi Everyone. Today’s edition of the Phlog is entitled “The Right Team”, and is Part 1 of a series of posts about lessons learned as a young manager. When Jon and I started PhatDeals back in September 2007 I don’t think we fully appreciated just how much manpower it woud take to see the company take on the shape of our vision. Now that I have the benefit of hindsight, I’d like to share some of my insights with you. Let me share with you my philosophy with starting a company out of college: Get Buy-in. What is Buy-in? Buy-in is when a person believes. Believes in what you do, believes in the product, believes in you and your team. Believes. When starting a web company, the first question a non-programmer asks themselves is “Am I going to out-source, or will I hire someone?” My answer is to do neither; instead, bring them on as a partner. Make sure your web programmer has bought into the idea, and bring them on as a partner. This has been our strategy here at PhatDeals, and I believe it’s been key in helping us to avoid many of the pitfalls startups normally face. The site looks amazing because Jon and Ruben are partners in the firm. If you’re considering starting up a company, permit me to suggest that instead of hiring employees who may or may not believe in your company, that you give new team members stock options and voting rights, and thereby gain both financial and personal investment from your staff themselves. As the Co-Founder of PhatDeals, it makes me happy to think of our Director of Sales and Marketing attending to a previously-unexplored way to format the excel monthly report- because it’s soo much cooler now, or of our Director of User Expereince up past his bedtime, experimenting with new widget ideas for the next feature release. You just won’t find that with people you’re paying hourly to clock in and clock out. Next, a great tool for helping to secure Buy-in. 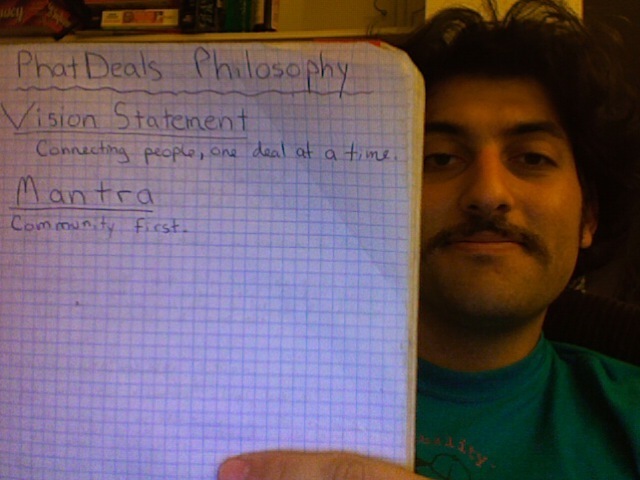 It says: PhatDeals Philosophy. Vision Statement: Connecting people, one deal at a time. Mantra: Community first. These are the guiding principles behind PhatDeals. Our raison d’être is to connect small businesses to their communities, thereby helping everyone. Our mantra is “Community First” because we are in it for the community, not the almighty dollar. So, why did I tell you about our Vision and Mantra? Because they offer a coherent way to keep our shared vision a tight, cohesive one. When we bring on a new person, if they can grok those two concepts then most else tends to fall into place.